This Friday-Sunday, November 7-9th, in Tucson, Arizona, at the Famous Handball Hotbed of the TRC, the World Players of Handball, #TEAMEDTL and ESPN bring you Race4Eight Stop #2–In the Desert!!! You can watch @ www.race4eight.com beginning with Elite Men’s Select Rd of 16 matches on Friday, beginning at 2pm (Arizona Time); as the WPH will stream four of the eight round of 16 matches. On Saturday, the World Players of Handball will flip to ESPN and the Watch ESPN App beginning at 10am local time when the Elite, to include Paul Brady (Ire), Emmett Peixoto (CA), Luis Moreno (AZ) and Sean Lenning (WA) fight to continue their trek to gather much needed race points; Mando Ortiz (CA), Marcos Chavez (CA), David Fink (AZ) & Qualifiers from multiple countries attempt to steal the spotlight. Sunday (Nov 9th) is finals day on ESPN beginning at 10am. Senior 40+ finals, a special Women’s Expo, Big Ball 4 Wall Doubles final and the grande finale–The Men’s Elite 8 Show Stopper! 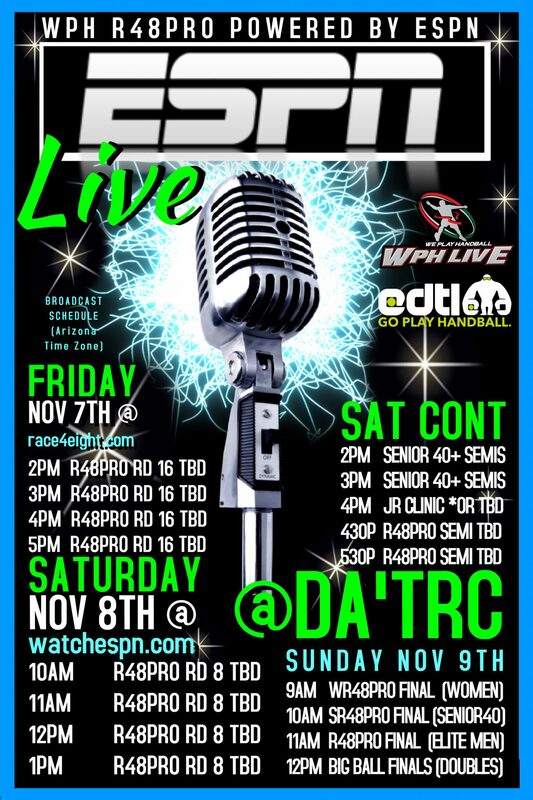 Please pass along the schedule (PDF) to your contacts and help us grow the game with ESPN & the WatchESPN APP.